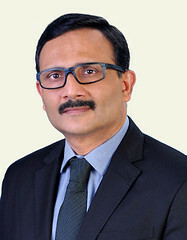 Dr. Roy J Mukkada, MD, DNB, from the Department of Gastroenterology & Hepatology, VPS Lakeshore Hospital, Kochi, Kerala, India, presents this video case. A 65-year-old man (an alcoholic and a smoker) presented with recurrent abdominal pain, weight loss, and loss of appetite. He was known to have had chronic calcific pancreatitis since 2014. 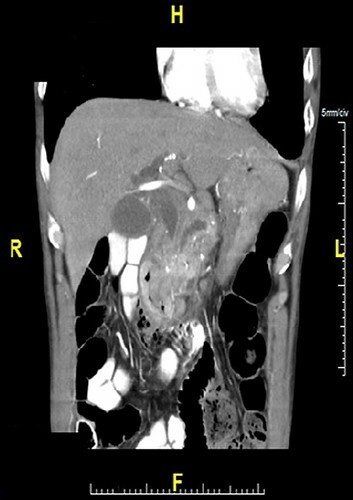 CT of the abdomen showed a 3.6 × 3.4 cm mass in the head of the pancreas, with calcification in the head and body. An EUS-guided fine needle aspiration of pancreatic head mass (FNAC) revealed a neuroendocrine tumor of the pancreatic head. EUS also showed prominent collaterals adjacent to the mass. One week later, he was admitted with massive GI bleeding. Endoscopy showed active bleeding from the second part of the duodenum. Hemostasis was achieved with hemoclips. Rebleeding occurred after 6 hours. Repeated endoscopy showed bleeding from the same site. EUS showed actively bleeding collaterals at the pancreatic head mass. Doppler showed high-velocity flow. EUS-guided placement of coils was planned. Using a 19G needle, we placed 3 coils because the vessel was large. Complete thrombosis of the vessel was confirmed by color Doppler. Surgery could not be done because of the patient’s high-risk comorbid conditions, eg, severe coronary and pulmonary disease. He has not experienced rebleeding and has been followed up for 180 days. EUS-guided placement of coils is an effective treatment for the management of bleeding duodenal varix. Figure 1. Pacreatic head mass. EUS-guided coiling is a viable and reasonably safe option for duodenal varix. Use of glue and its associated complications can be prevented. Duodenal collaterals can be managed by EUS-guided interventions. Use of coils in endoscopic intervention is gaining acceptance. In our experience we have used coils alone in refractory gastric variceal bleeds in more than 40 cases. We have also used coils in refractory rectal variceal bleeds successfully without using glue.